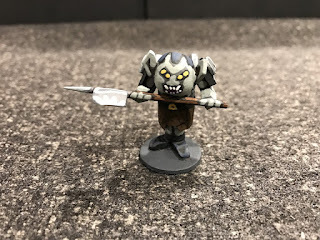 For the Balin's Tomb scenario in the Lord of the Rings Strategy Battle Game rulebook, you need 36 goblins (12 each of spear, shield, and bow guys), 3 goblin officers, and one cave troll for the evil side. Of course, on the good side you need the Fellowship. 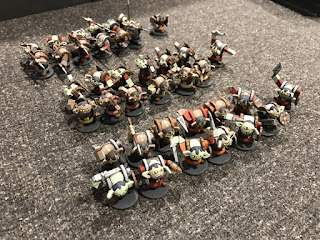 I started this project about one month ago (I checked on the date of the first posting about goblins I did) which means that I've been working on this project off and on over the past 5 weeks. 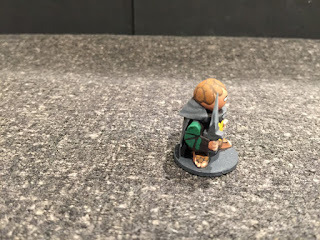 During that time I completed 36 goblins, 3 goblin officers, and all of the Fellowship, including an "invisible Frodo," except for Gandalf (who is at this moment on my painting table almost fully constructed, so he'll be finished this week). 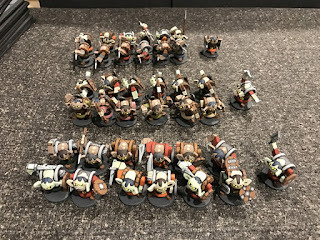 There is NO WAY I could have ever painted this many regular miniatures during this time, not to the standard that I like to paint to. 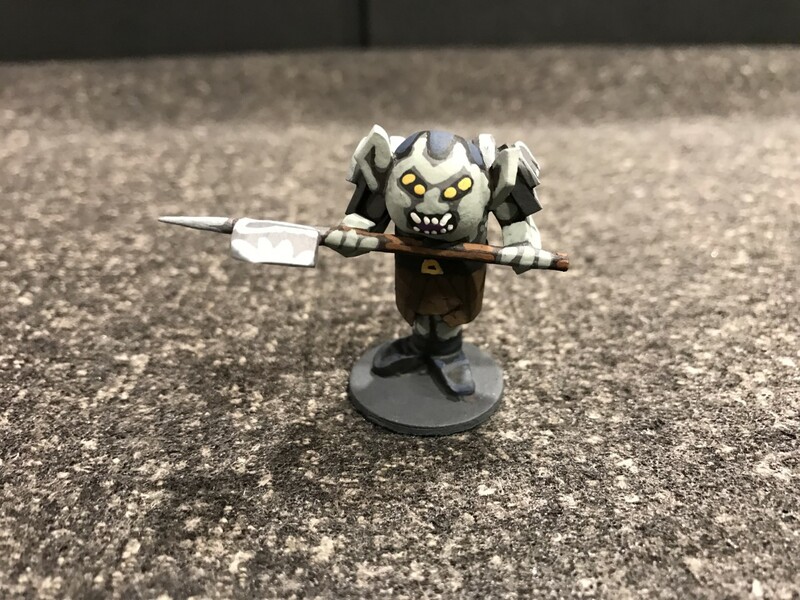 As for the cave troll, I can't decide whether to go with my old cave troll (who frankly looks a little outdated at this point ... he is after all almost 2 years old!) 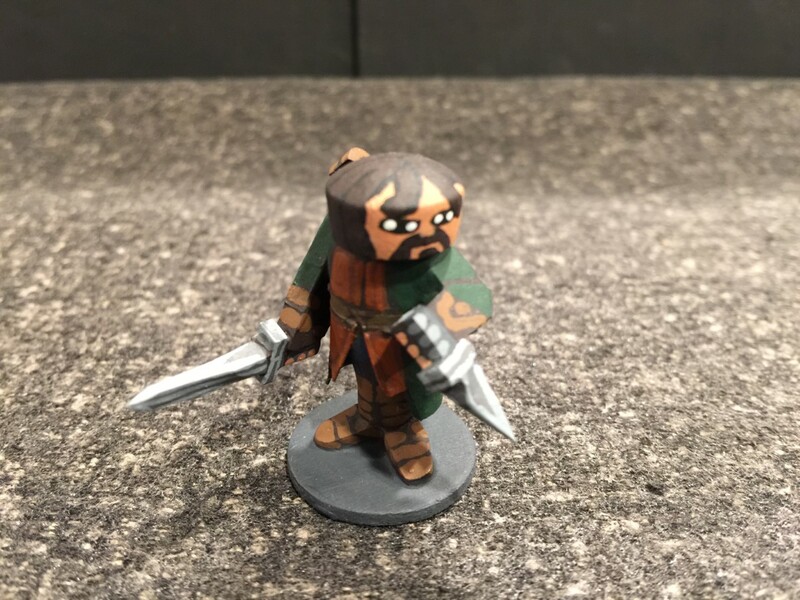 or make a new cave troll with my more developed construction and conceptualization skills so as to be consistent with these newer LotR figures. I'll probably end up making another one. But my point is that a little over a month ago, I decided I wanted to put on a fantasy skirmish game for my gaming club. In what will end up being about 6 weeks time, I will have completed all 50 figures for it (you need two Frodo figures). Not bad! Rather than showing you the "new goblins," I thought it would be more impressive to show the three different types with an officer all in one picture (almost as units here even though they do not all stay together in the same unit during the game). 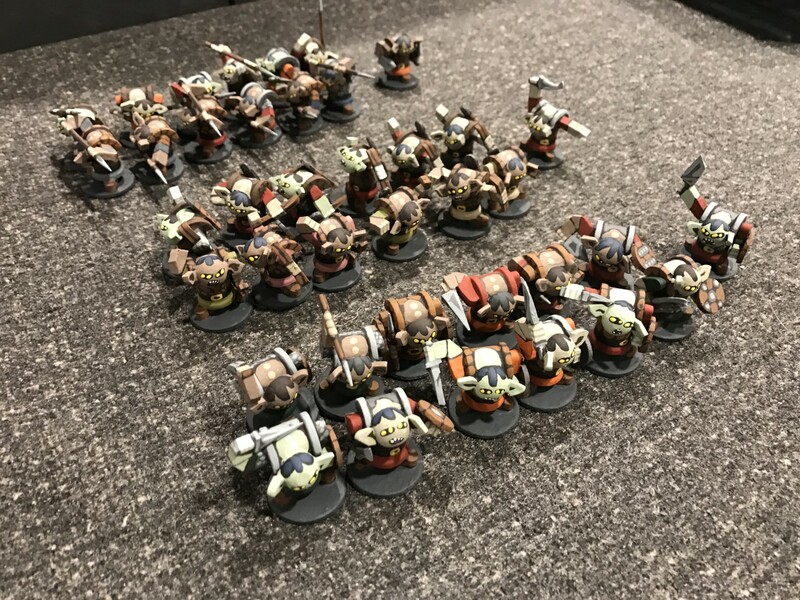 So I've got a group of 12 spear goblins with an officer, a group of 12 bow goblins with an officer, and a group of 12 shield goblins with an officer all in the same picture. I think they make quite the impressive horde! Event though these miniatures are identical to each other in terms of body and feet, the variation in the arm position and the head tilts really makes them look a bit less uniform (more like a horde of angry goblins!). I continue to be impressed, actually, with how much just varying the arm position increases the diversity of appearance of these clearly simple miniatures. I wanted a regular Frodo and an invisible Frodo. Nothing new construction wise, and this close up picture makes me realize I need to go back and make his blue pupils round again ... forgot to do that after I added the whites of his eyes. 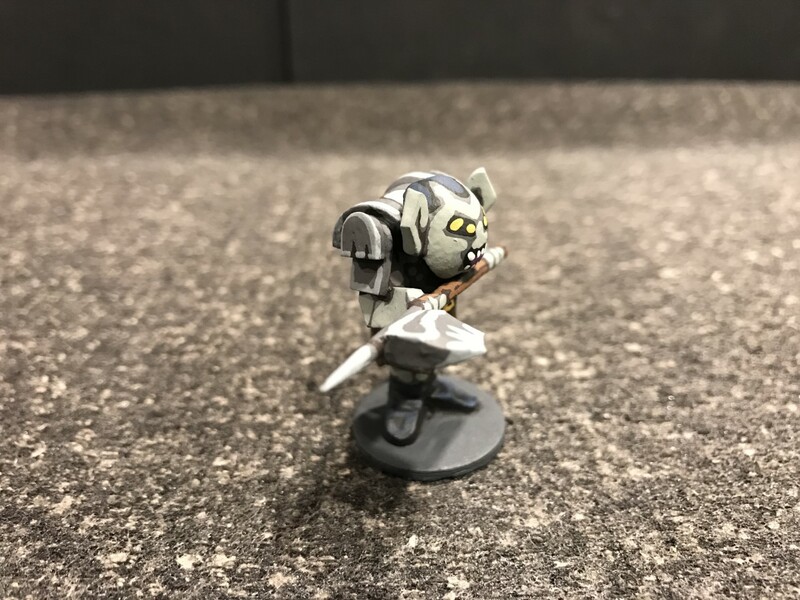 Obviously there is no way to make a wooden figure "clear," so I went with the "ghostly" gray look for him when he is invisible. I just stuck with the exact same pose of him holding the ring between his fingers, even though it wouldn't be correct when he is invisible as the ring would be on his finger. Same traditional Hobbit construction. Unfortunately, in my opinion, Frodo's clothing except for his bright green cloak is quite boring (just different shades of brown with a white undershirt that you don't really see because of all the layers he wears!). The only new thing really with the non-invisible figure is Sting. I just painted the sword blade a white undercoat and then used the florescent blue paint, that I sometimes use on my sci-fi figures for bright lights and buttons, and coated the white blade with this blue paint. I ran the brush along the edges of the sword blade while the blue paint was still wet to take away some of the paint to allow the white to show through more, giving the impression that it is "glowing." When I get Gandalf finished, I will do a shot with all the Fellowship, and then I will do a shot with my new Fellowship figures next to the old Fellowship Craftees I did a couple of years ago and let you be the judge of which you like better. One of the things I like about the new goblin construction is the head, ears, and shoulders. 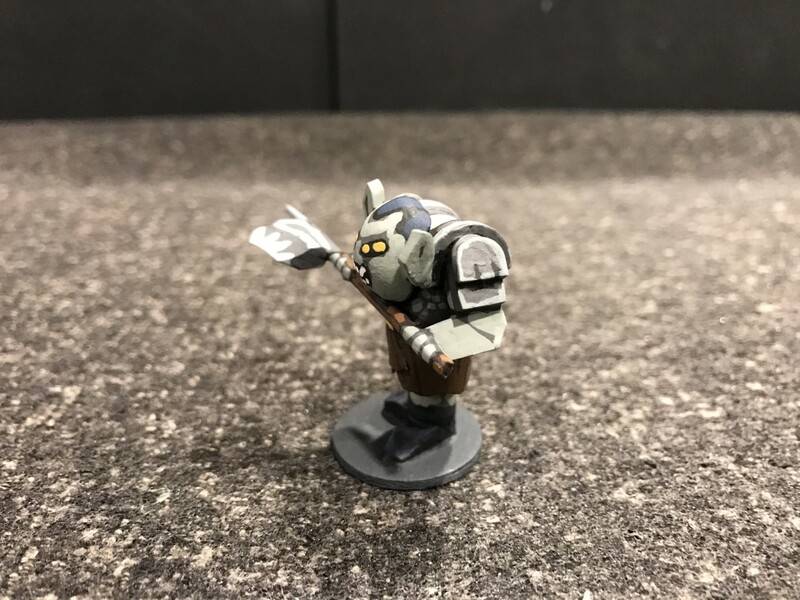 I wanted to do an orc with a similar type construction, but in order to make the figure human sized, I would need to use the milk bottle construction method. I combined the two and here is what I came up with. Turned out pretty well, I think. I used a bead that is one size larger than the ones I use for the goblins (I believe it is a 1/2" bead) and split it for the head. The shoulders are the split 1/2" spool, just like for the goblins, and the ears are cut out of tile spacers, also just like the goblins. I used paper for the leather "skirt" and tile spacers for the feet just like I did for the Aragorn, Boromir, and Legolas figures. I gave him some upper arm armor plating cutting tile spacers to fit. You can see this best in the second and fourth images. This is obviously a test figure, but I think I have enough to go on in terms of making a whole unit of Mordor Orcs, or I could also probably use this same construction method for Uruk-hai. 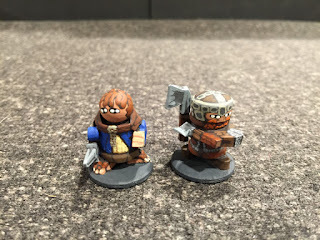 More Goblins and More Fellowship Members! Six more goblins, archers this time, and two new Fellowship members, Sam and Legolas. 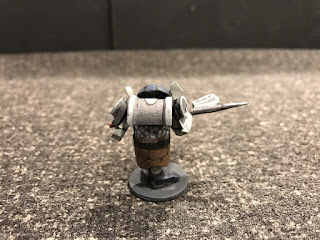 Nothing new, just a bit more of a crisp paint job (practice improves performance!) and a bit more dynamic poses for the shooters. I'm trying to embrace my inner Marvel comics way of doing things, the more over the top the body position the more powerful and striking it looks. 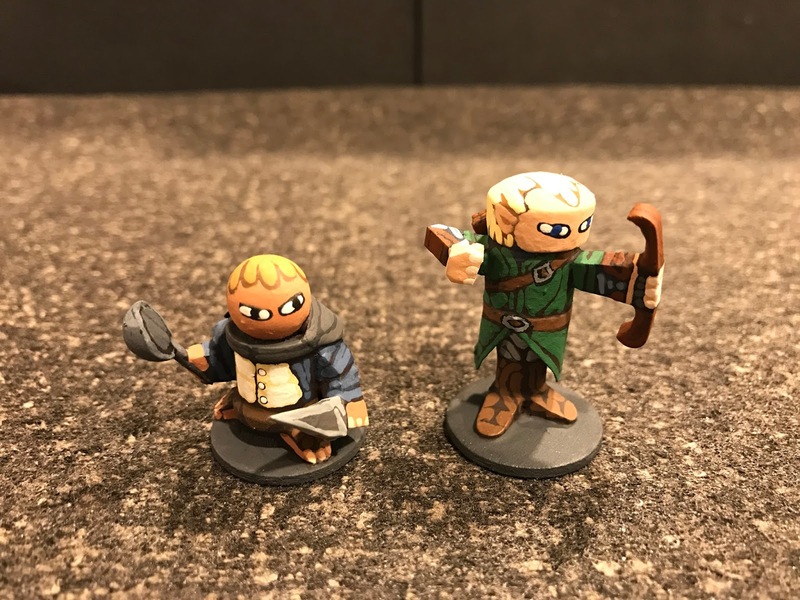 Also used the new lighter skin tones, just so that there will be balance between the different goblin types (shield users, archers, and spear men). Samwise and Legolas. 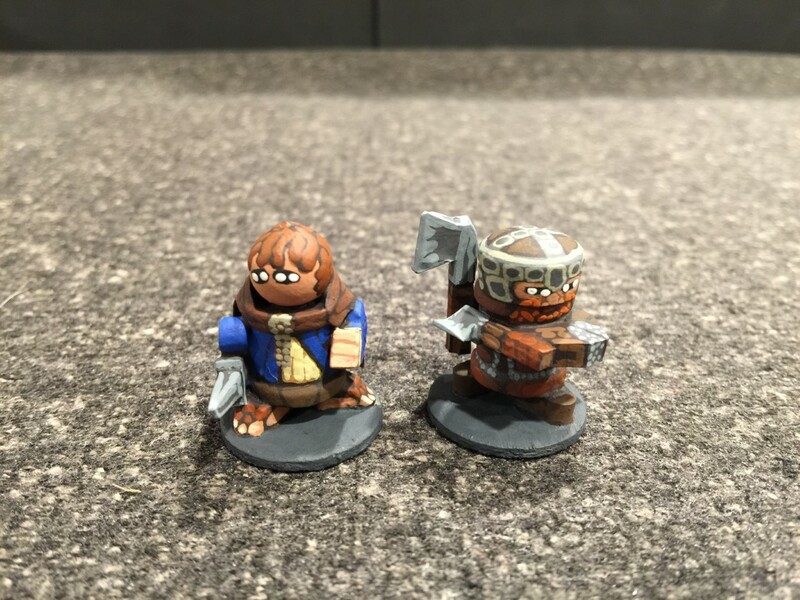 Yes, of course I had to put the frying pan in Sam's hand given that the main game I am making these guys for is a Balin's Tomb scenario. "I think I'm gettin' the hang of this!" As you can see I continue to improve on my cape construction. Leggy's quiver is just a tile spacer I cut to the right shape. Sam's frying pan is a small round bead cut in half, then a toothpick was glued into the slot in the middle left over from the hole in the bead. I had to trim down the toothpick a bit but the Craftee gods were on my side, I did it in one attempt which amazed me. I thought for sure I would go through a dozen toothpicks before being able to cut a small sliver off one that would make it the right depth give the slot in the split bead. I went a bit crazy with cutting the tile spacer for Legolas's right arm. I really wanted to see if I could do an arm position with a hand that was a bit more realistic in terms of how a person really looks when they pull back a bow. In the past, I've done more of an "Impressionistic" right arm position for bowmen, which is fine for these figures, especially the rank and file troops for a large historical minis game. 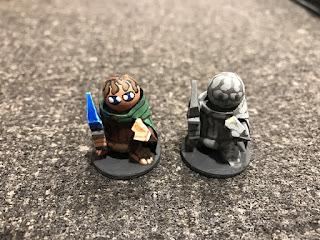 But for these slightly larger figures designed for Lord of the Rings skirmish games, I wanted to be a bit more detailed. I'm pretty please with his arm. His "skirt" is paper, the same as I did for Aragorn and Boromir. However, his flares out a bit less, so it is closer to the width of the milk bottle at its widest point. Pretty pleased with them! Onto 6 more goblin spear men (which will mean I will have 36 total goblins at that point, 12 of each type! ), and Frodo. I'm going to do a regular Frodo and then a Frodo with the ring on. 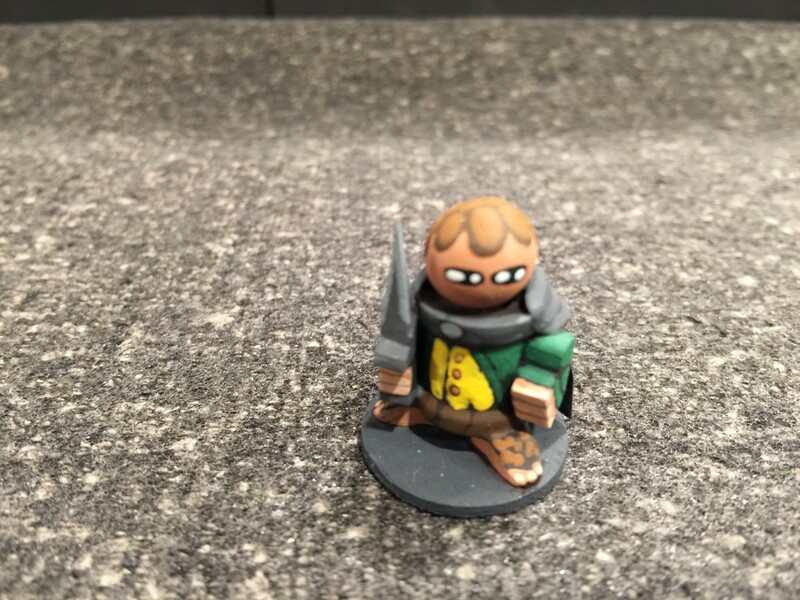 I have an old Cave Troll that I'll just recycle for the game (I'll post pics of him later). That will leave me just Gandalf and the Balrog to do. These two figures, however, will be the most challenging ones I have to do, especially the Balrog. We'll see how I do with them. I might end up doing Gandalf first by himself as I think the Balrog construction is going to be something that takes me a while to do. My ideas so far are a bit too involved, so I need to scale them back to something that I can actually do. 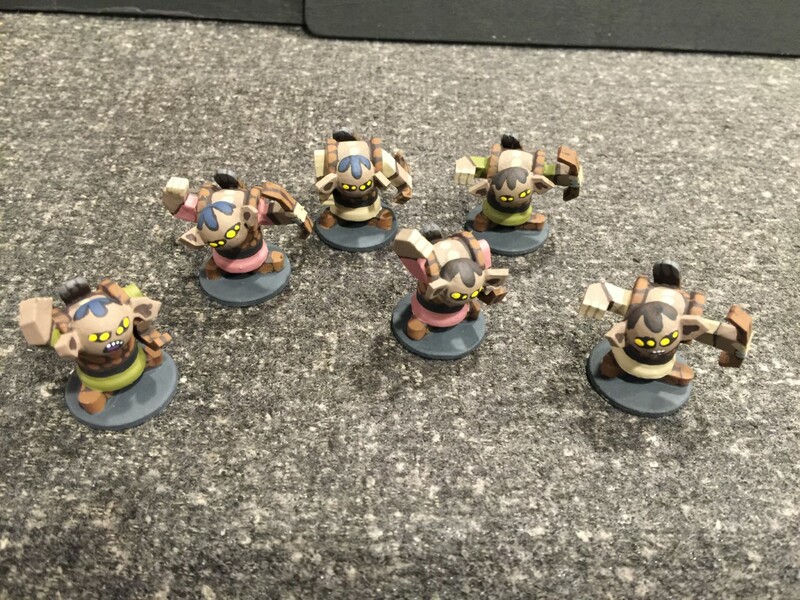 More Gobbos and Fellowship Members! 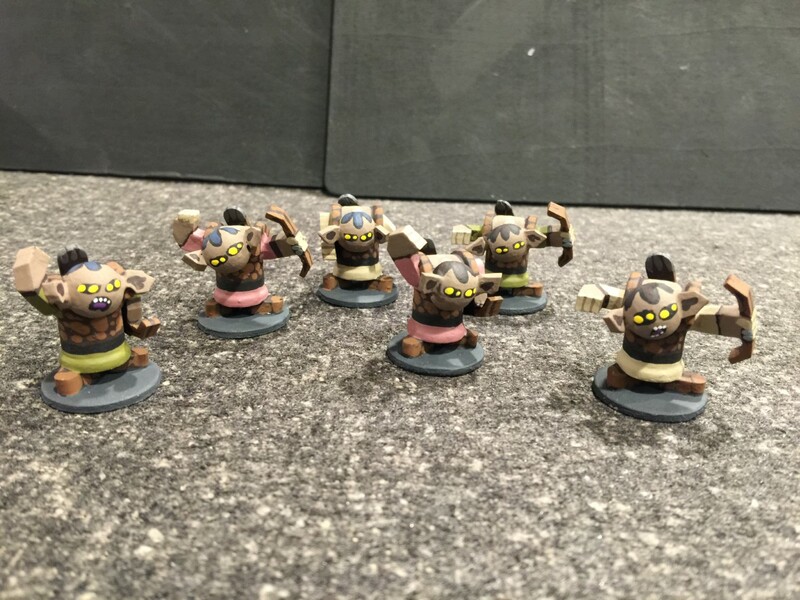 Got another 6 goblins finished and two more members of the Fellowship done as well. 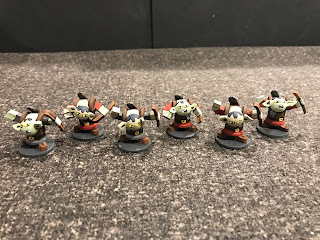 Here are the goblins. Nothing really new here construction wise other than a few different arm poses (like the angled shield guy in the middle). 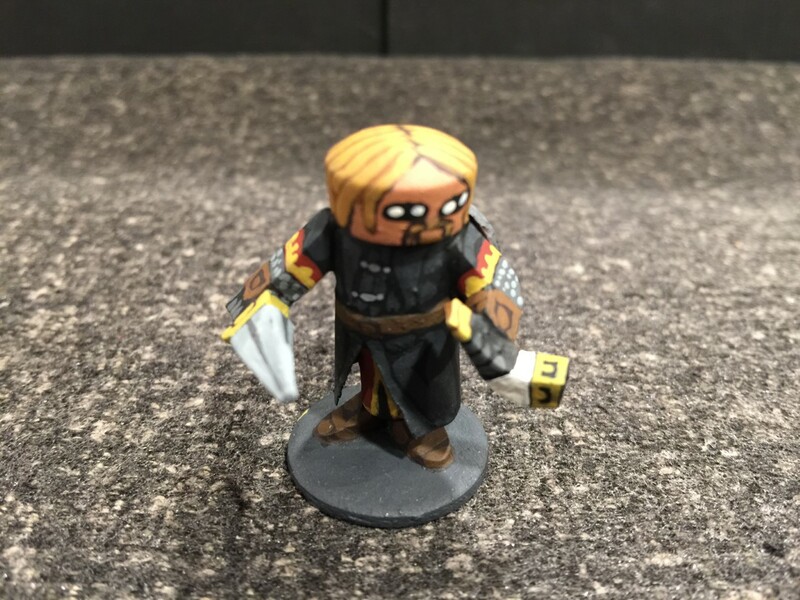 But, painting wise I did use two new skin tone colors. Can't decide if I like them or not, one is a light greenish gray color and the other is sort of a "sand" color. 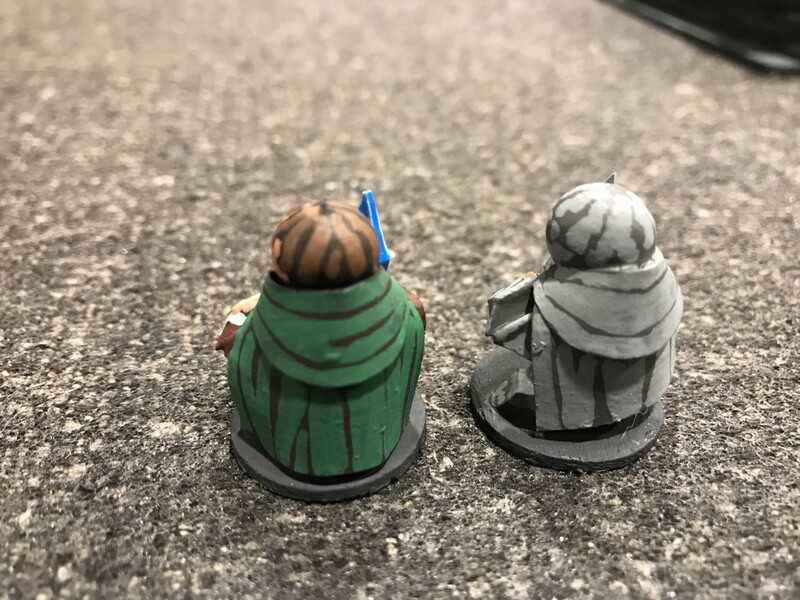 In this next picture, on the far left and right are the two new skin shades, while in the middle is an old figure that has the skin tone that I've been using to date. Pippin and Gimli! 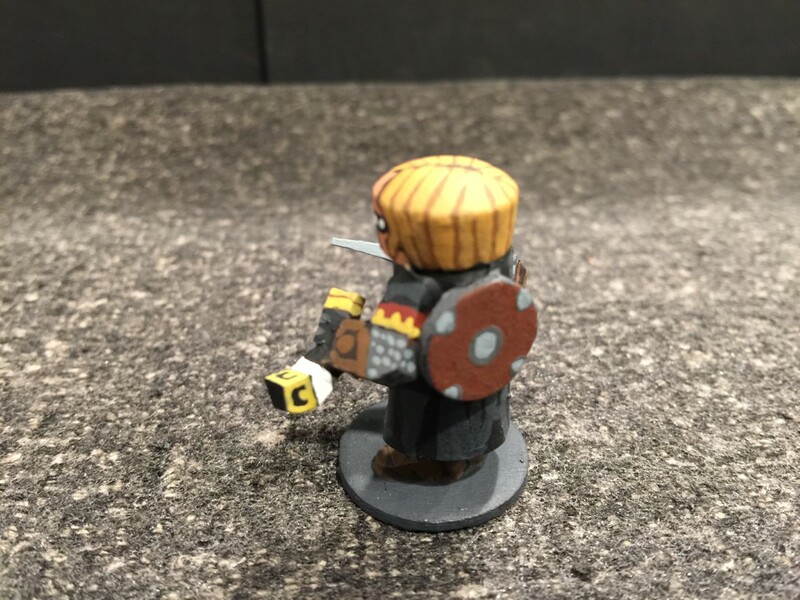 Pippin is obviously a variation of the "hobbit construction" I used for Merry, I just changed the angle of his arms a bit and had him facing to his right instead of to his left. Gimli is the same construction as the hobbits except that I used a tapered plug for his head/helmet. I also had to give him the axe and the throwing axe both. For one, I think it looks cool. 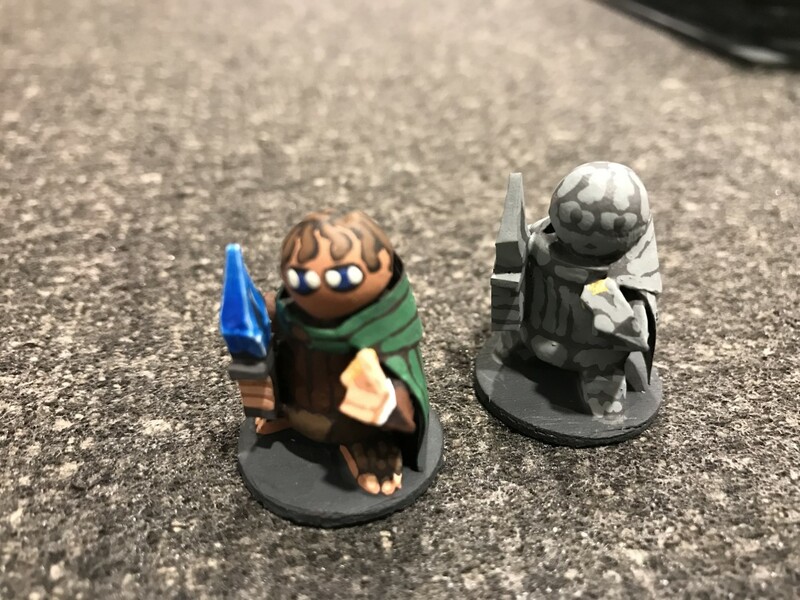 Second, he used both during the time the Fellowship were in the Mines of Moria which is the game that these figures will be used in, at least initially. The first Gimli I made years ago I used a slightly larger spool to make him a little taller than the hobbits. With the addition of his feet, it just seemed to make him too tall if I used the larger spool for this figure when I lined him up next to the humans. So I went with the smaller spool. As is often the case, the more you do something, the better at it you get. Pippin's cloak turned out quite nice and better than Merry's. 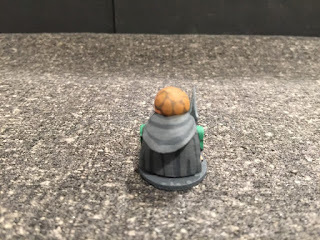 I got a better angle on the hood, the transition between the spool and the hood is seemless (important because the top of the spool is a part of the cloak when it is painted!). 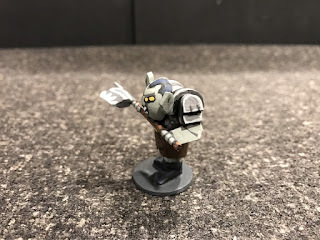 It is easy to get carried away with these hero figures and try to do too many details on them. There are a ton of things I could have done with Gimli. His armor and coat are very complicated (do a google image search on him and you'll see what I mean!). 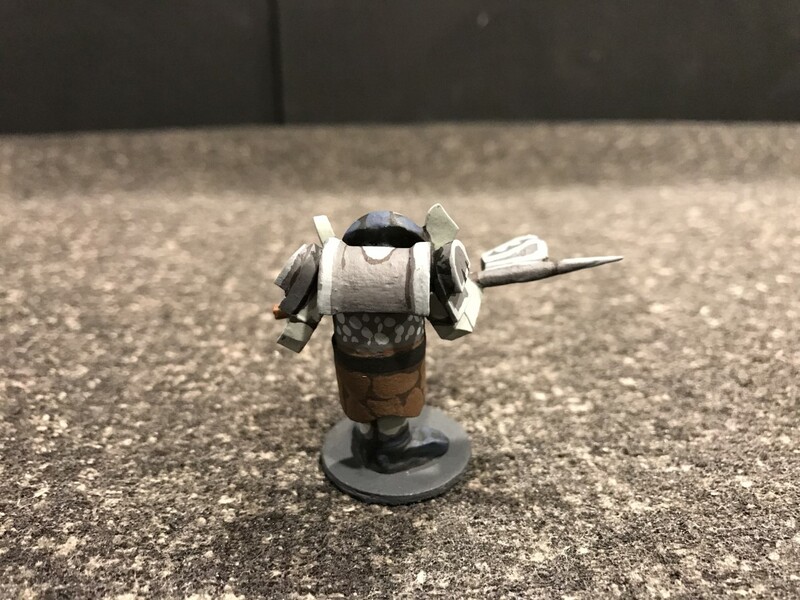 But he is still very small, and keeping with the minimalist approach with these figures, I decided to pull in the one thing that made him unique in appearance from the other Fellowship members, and that is, beyond his helmet, his blue bed roll slung across his lower back. 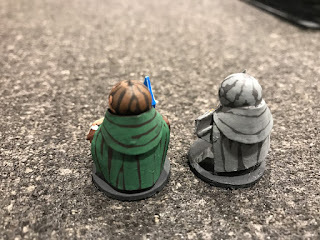 It's just a tile spacer cut to fit, but the blue color and the lighter colored ropes not only are indicative of the real character, they break up the high amount of ruddy browns of various shades to give the figure a bit more visual interest. Pretty happy with them. 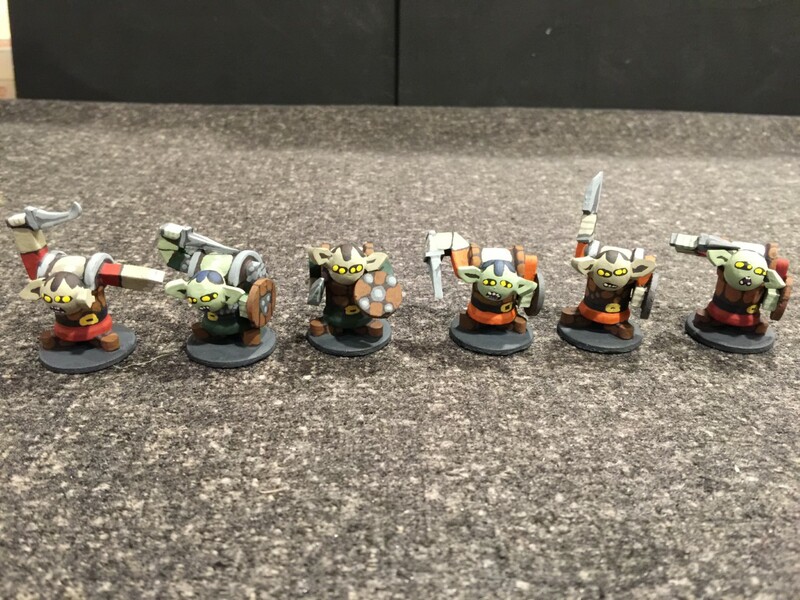 Now onto 6 more goblins and two more members of the Fellowship. Hmmm ... who should I do next ...? 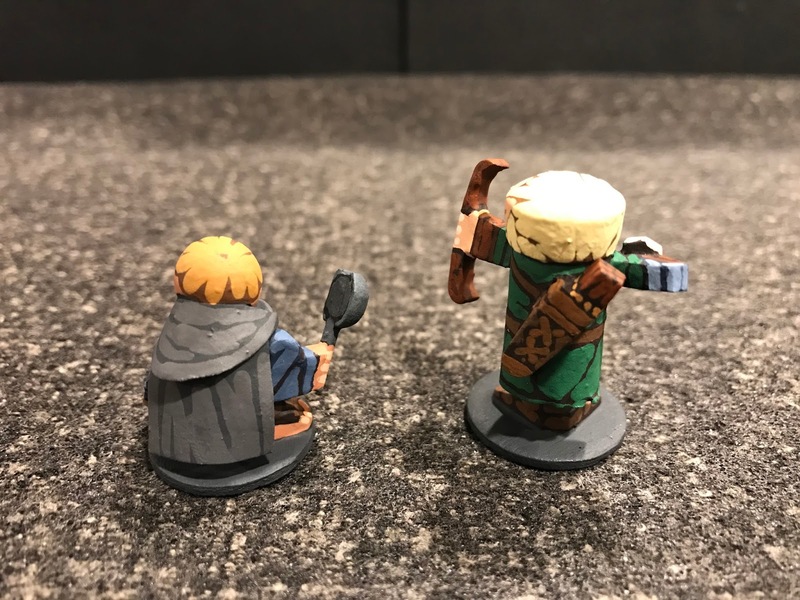 Okay, there is no way I am going to be able to wait to post my Fellowship figures until all of them are finished. I like them too much and couldn't wait any longer to post pictures of them, so here they are. They turned out WAY better than I even hoped. Here we have Boromir, Merry, and Aragorn. Now let's see them one at a time. Waahhh! Waahhh! Waahhh! Boromir, Son of Gondor, with his famous horn. And his shield strapped to his back. 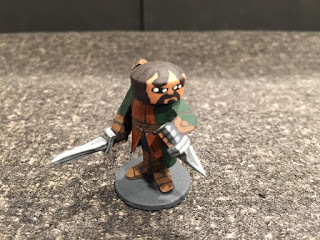 He, like Aragorn, was made using the regular old upside down milk bottle construction like I've been using for my fantasy figures for a while now. Thing is, both he and Aragorn wear a coat-like piece of clothing (not to mention Aragorn's leather armor has a skirt to it), and this clothing sticks out from their bodies. I could have just ignored this and painted it all on the milk bottle. But the problem with this is that the milk bottle tapers smaller as you get down to their feet. So it just would not have looked right. In other words, had I done that, Boromir's black leather coat would have been wide at his shoulders and very narrow at his feet. That just doesn't look right. Speaking of feet, I actually put tile spacer feet on these guys, which is also different than the other fantasy figures I've been doing (the heroes anyway). To make the coat, I used a piece of regular white paper and cut it to the right shape, put some glue on the milk bottle, and wrapped the paper around the wooden milk bottle. It was a little fiddly, but honestly, once the glue dried, it is a really sturdy coat. It only goes half way up the milk bottle but to remedy the extra thickness of the paper, I just painted the top lip of the paper as his belt, which makes it look very natural. Everything else is standard construction except for his horn. I just cut it out of a tile spacer. Same basic construction. 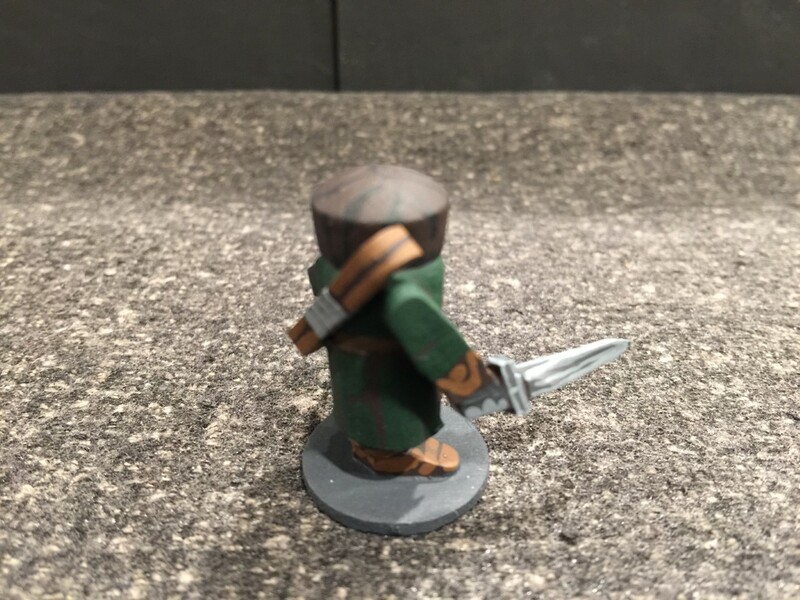 His coat/paper piece is the same except that it's a bit shorter in length, and I also cut two levels in it because the green coat is longer than the skirt of his leather armor. Not the best picture but I learned from my other Ranger figure how easy it is to do a tile spacer bow and glue it on the figures back. Did that with Aragorn too, as you can see. My favorite things about this figure are a) the feet, and b) the cloak. The feet you can see well here. They are tile spacers just like I did for the goblins (in fact his body is the same 1/2" spool as the goblins), but rather than leaving them consistent in thickness (like a pair of goblin boots would be in my mind), after gluing this figure to the base, I cut the feet down at about a 45 degree angle from the edge where it glues onto the spool body until you get to the end of the tile spacer. Makes for a nice tapered foot shape I think, especially after I painted the hair on the top of the feet with the toes sticking out at the bottom. 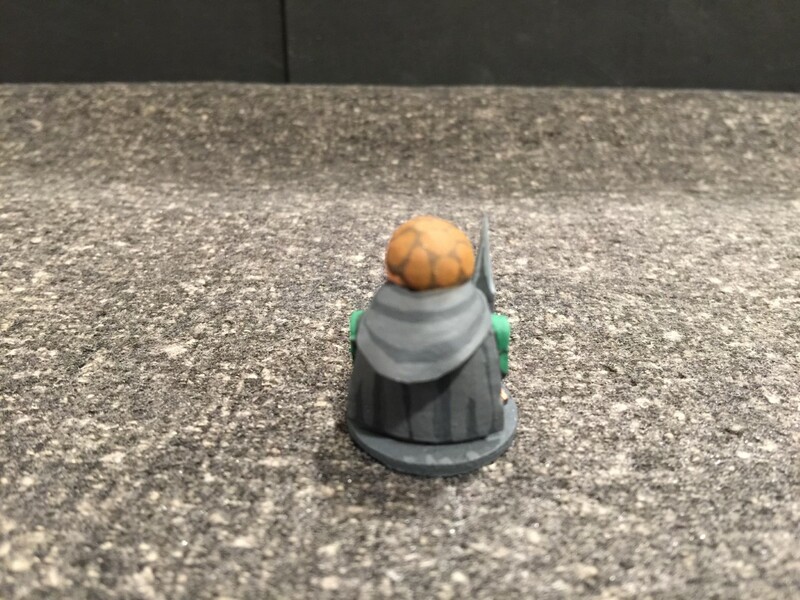 The cloak is just two pieces of paper. The first is a rectangle glued over the back. The second is a crescent moon shape that is glued into place to make the hood. Then I just painted it. I have done some Fellowship figures in the past where I used craft felt to make the cloaks. They look good because they are "fuzzy" like cloth (because they are cloth! ), but they are pretty tricky to make and only super glue will hold them in place. And invariably you get super glue all over the fabric which changes its texture and color, or worse than that all over your painted figure because you can't paint the figure once the cloak is on it without getting paint on the cloak, which of course ruins everything. 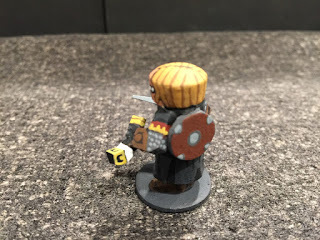 But the bad part is that you end up getting super glue on the painted figure usually when you are gluing the craft felt cloak into place, which is also a problem. The paper was a lot easier to work with, I could use regular white glue to put it into place, I glued it onto an unpainted figure, and once the glue dries it is very sturdy. Good luck at the sword arm and the other foot, as well as the profile of the cloak. That was another problem with the craft felt cloaks with figures at this scale, they were just too thick. 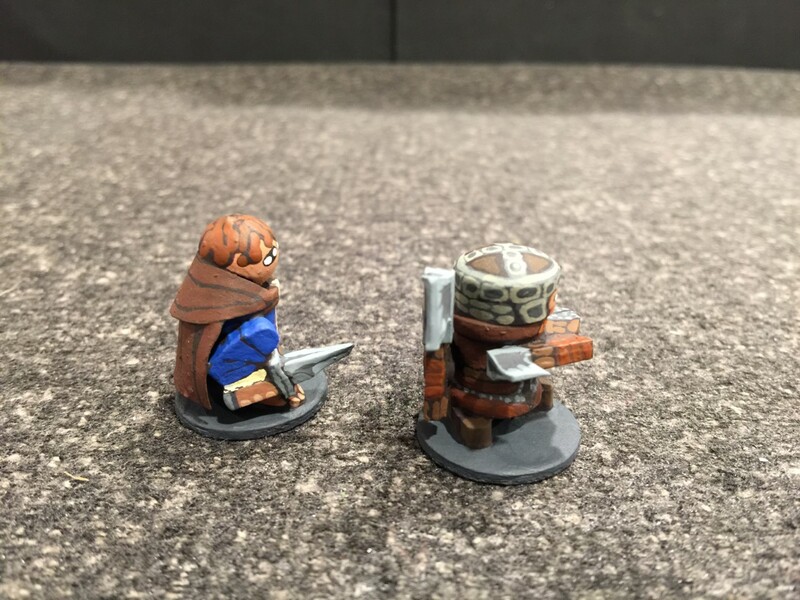 The craft felt cloaks look more like parkas than cloaks. Good look at his other hobbit foot too in this picture. I hope you like them! 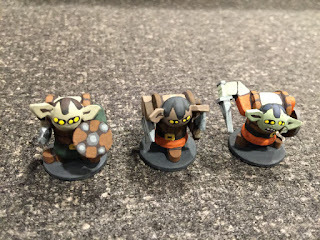 I'm working on another batch of goblins now as well as Pippin and Gimli. Gimli is giving me a little trouble, but I'm confident I will work it out eventually. 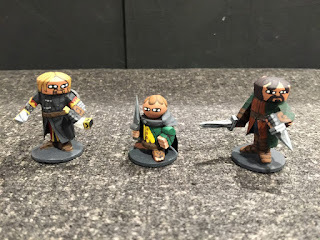 I have decided to put on a Mines of Moria minis game scenario for the gaming club I participate in sometimes using the Games Workshop Lord of the Rings Strategy Battle Game rules and scenarios. 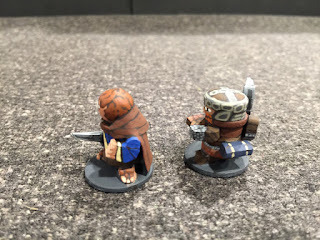 It's a really fun skirmish system (does sort of fall apart with larger armies, but for the adventures of the fellowship, or the party in the Hobbit, it's a really fine system. In addition to the Fellowship heroes, the Mines of Moria scenario calls for 36 goblins, 12 with shields, 12 with bows, and 12 with spears, three goblin leaders, and 1 cave troll. So far I've got 6 shield guys and 6 bow guys done. 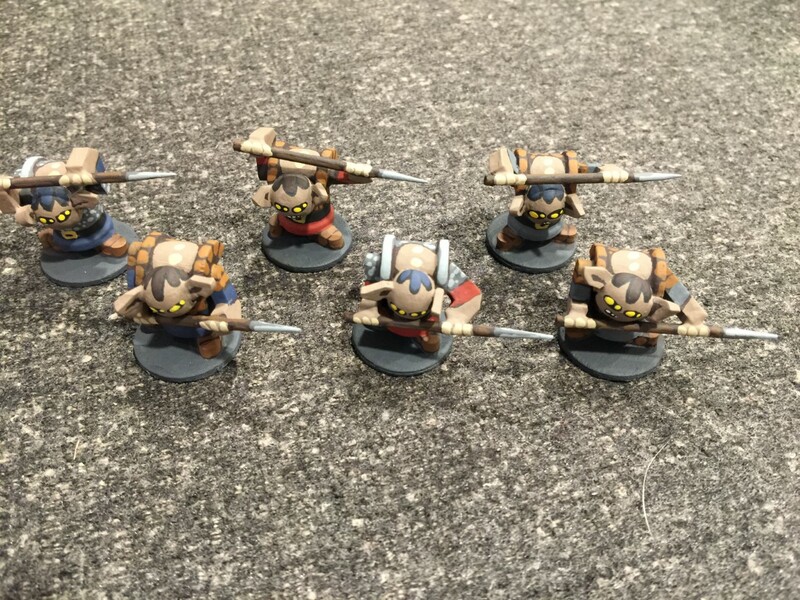 Over the weekend I got 6 spear guys done as well, so that's about half of the goblins already finished. Also, as a teaser, I'm starting to do the Fellowship as well and got Merry, Aragorn, and Boromir finished over the weekend too. 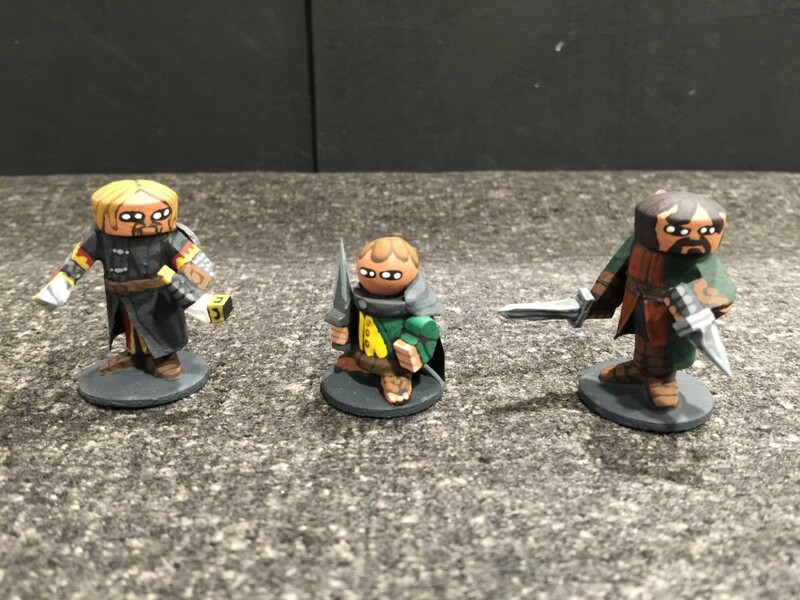 But I am going to save the Fellowship figures and post a picture of them all together when the entire party is finished. 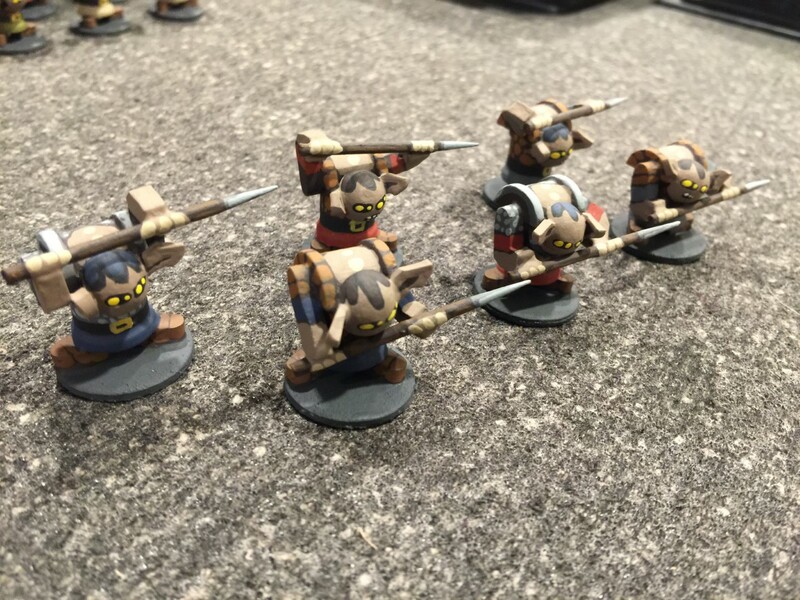 Here are the goblin spearmen. 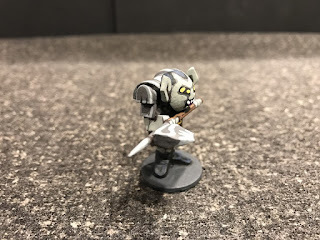 I am continuing to be happy with the goblins construction. 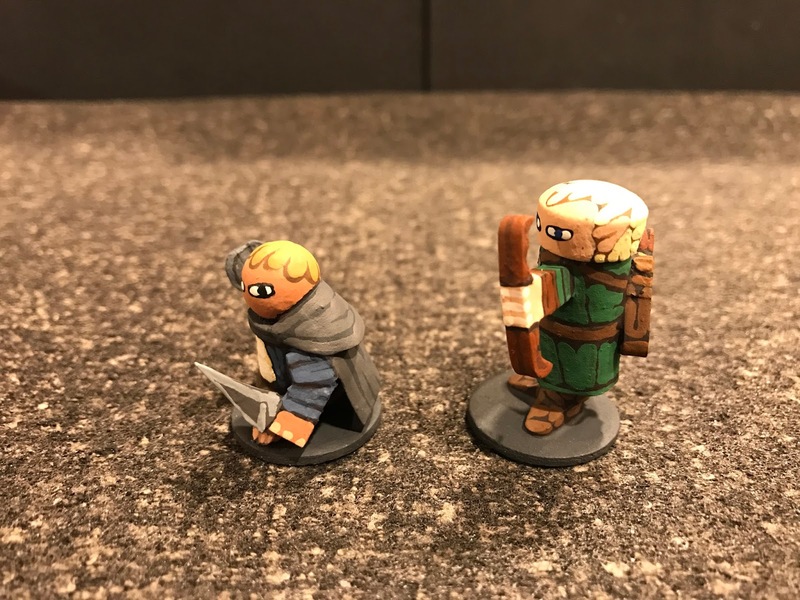 For the next group of 6 that I do (of each of the three types) I'm going to vary the skin tone a bit (some light green, some sort of a grayish sand color) just to give some variety. I'm also going to try and stay as dynamic with the poses as I can varying as much as the limits of using spools and tile spacers will allow. And as before, I can't stress enough, once you get the construction plan down for these wooden warriors, the construction and painting time is significantly less than for commercial figures. 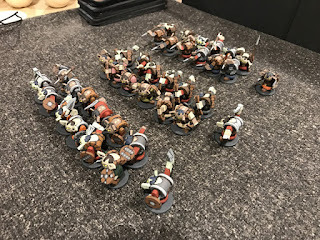 I got 6 goblins, 1 hobbit, and two men finished in a weekend, with a total of no more than 4 or 5 hours total work involved. 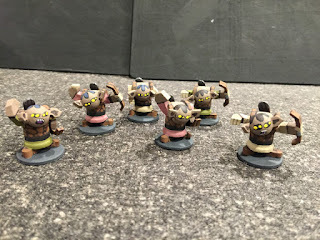 Not to mention as Dale said in one of his posts, does anyone else have goblins like these? Just finished up some Goblin Archers today, thought I would post pictures of them. Very similar to the other fellows I just finished, except obviously these guys are archers. With the bow arm, I went with a single tile spacer construction. Much sturdier and you only have one glue point, where the arm meets the body, so that's better too. 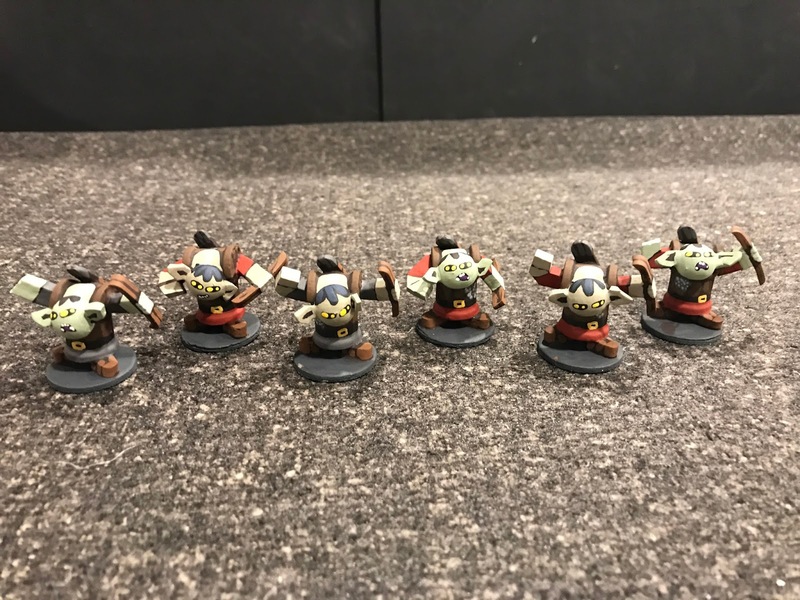 Not the best looking "bow" in the world, but hey, they're goblins after all! 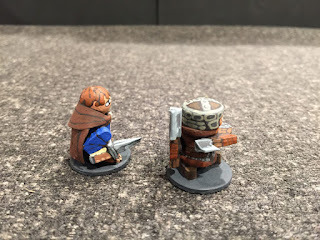 Paint wise, I decided to give these guys more "hide" looking armor, so I just painted different sized circles and semi-circles to create the hide effect. 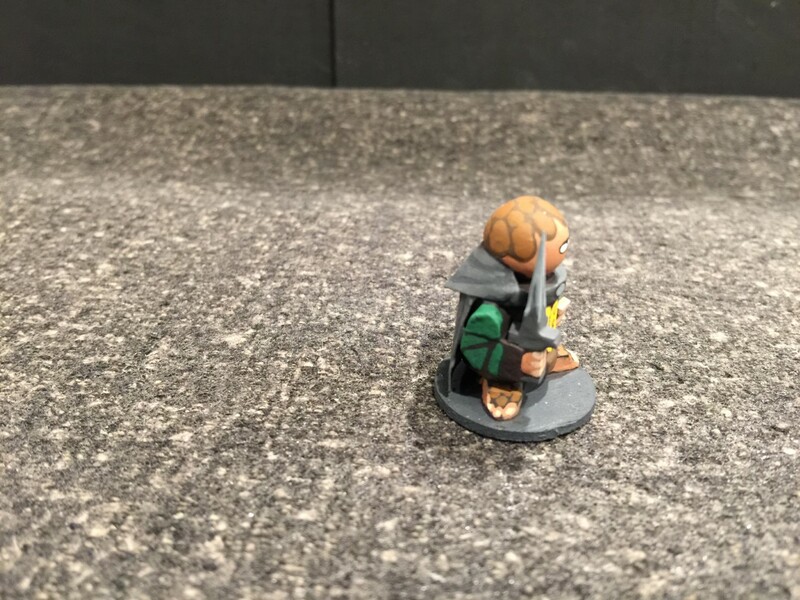 I also did not paint the bases beyond a dark gray color (in other words not floor tiles painted on these). I'll see if I like them in the long run. These guys highlight one of the more desirable things about wooden warriors. 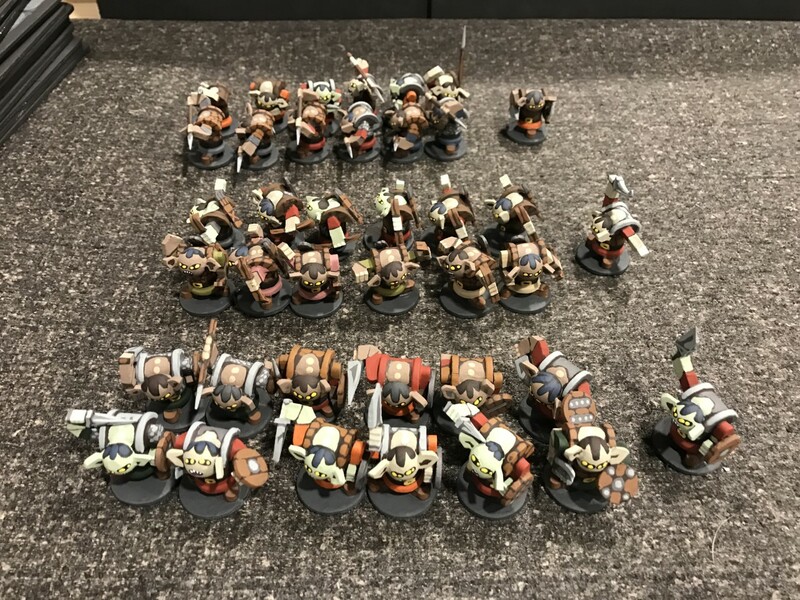 In a little over a week, I put together and painted 12 miniatures to a standard I would be more than happy with putting on a gaming table. 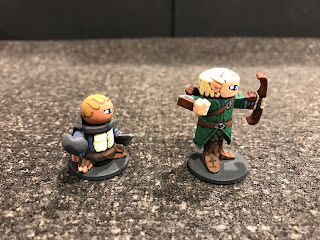 And I really did not work on the archers much this week, maybe a total of 4 hours to produce 6 figures across 4 days (I started them on Monday night). And a lot of that time is drying time, so I could have been working on other figures at the same time. I can be pretty fast with my metal and plastic commercial figures, but not that fast!